Cross-posted on the Collegian: Web Wire blog. Blogging regularly is more difficult than you would think. I’m not sure what keeps the Kottke’s, Scoble’s and Jarvis’ of the world going. People have been asking me to post more, so I thought I would outline how we currently post stories on our Web site. Our process is designed for stories to come right off the print pages. All the pages of the print newspaper are designed in a program called QuarkXPress. It seems most people around have a love-hate relationship with the program, which makes design easier but has a lot of annoying little quirks. I don’t design the paper, so I am often indifferent. I do need it to get stories onto the Web though and here I have a beef with the software. Quark has a nice feature where it lets you copy the formatted text in HTML format. This is both beautiful and troublesome though, since its HTML is often poorly formatted and includes some bizarre characters. Next we copy the text from Quark into the Collegian Web Generator (Da Da Dah!). The Web Generator is sophisticated, simple, and only occasionally buggy. It was created by Joseph Shimkus in 2000 with the best wisdom from that time. At its best, it pareses Quark-speak into more readable HTML. It also lets us add headlines, photos, and shadow boxes to the stories and spits it out in our Web site’s standard template. It also includes different formats for things like columns and editorials. 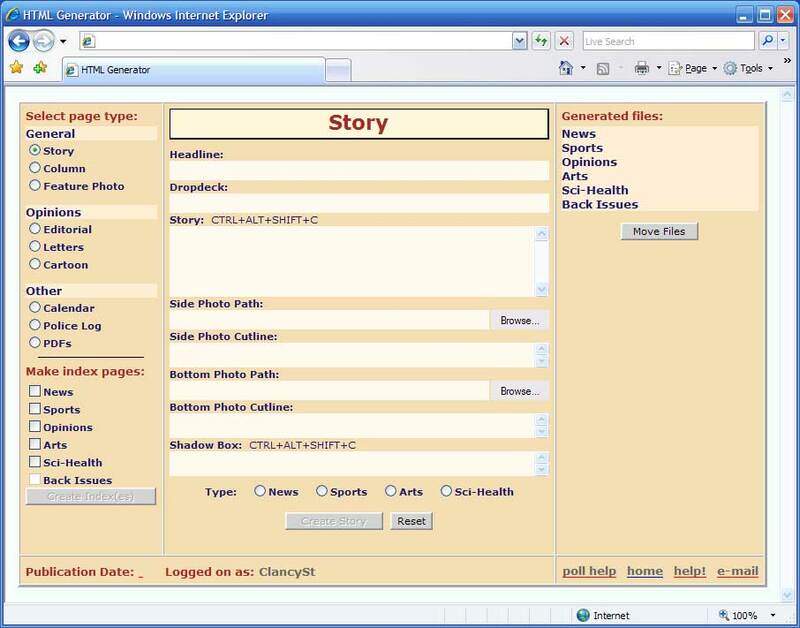 After all the stories are done it creates the section pages for news, sports, etc. One hang up with the Web Generator is that it spits out static files, only slightly souped up HTML pages that aren’t very different from your ePortfolio site. This means that we have to move these files around on the site and create links to a lot of things by hand. And while this may work OK for your Dane Cook fan site, it gets more complicated when you have more than 100,000 articles to maintain. We can’t really update the Web site until the last page of the paper is sent off to our printers, which is around 1 a.m. on a good night. We also have to go through most of this process whenever we do a Web update mid-day, which is a hassle. One advantage we have on the Web, as compared to the print, is that we can always go back and fix our mistakes. Fixing stories requires someone to go in and edit the actual HTML, so its not really made for the tech-queasy. All this is handled by a couple students and our systems staff who perform some of the more thankless on the site. If all this sounds ugly to you, you’re right. We’re not quite on the cutting edge yet. Still we’re different than most other newspaper’s, who just outsource their Web site work. We like to think by keeping things in house we’re able to give the site the extra love and care that makes our site better than the rest. We are actively looking for ways to improve the site though, so you’re welcome to send me your thoughts. And I promise I’ll write again sooner rather than later.